Discussion in 'General Discussion' started by bernjb56, Feb 11, 2019. I always bought Hohner harps - still have the first one I bought in 1965 - a SuperVamper in C, although it is rather worn out now. Then I was in London about 10 years ago around Covent Garden - there was a blues band playing in the street and I went up and asked the bloke with the harp what make he was using as it sounded great - Lee Oskar - so I bought 5 of them after that. Cheaper than Hohner and easier to bend the notes (unlike Marine Band that has rather stiff reeds that don't bend easily so blues playing isn't that smooth). Ah, that’s interesting. Thanks. I have a friend at our uke group who uses Lee Oskars, and they sound real good. Have to say the Special 20 is pretty easy to play, and get those bends too. That was a borrowed amp, they’re bloody good for the size. My usual amp is a Blackstar HT 20. Dubs, Jack Tatty and Soggz like this. Dubs, Jack Tatty, Jules65 and 1 other person like this. Dubs and Jack Tatty like this. I have posted my collection on here before. I play most evenings as it helps me chill out. I'm on the look out for either a 1979 strat or les Paul at the moment to add to the others. Just learn A, D and E. Play Any Foo Fighter song then! Guitars I’d like to own if I were loaded. Er .... and lots more probably. thats all of em.. ! I play a bit, only a little bit. But I am fortunate in the fact that I can walk into any guitar shop and pick up the dearest one there, play it through the most expensive amp and pedal bank there and make it sound just as bad as the cheapest one. Dubs, Jack Tatty, Suss and 1 other person like this. All you need is a battered Burns and an AC30, sorted. Jack Tatty and Soggz like this. Now being totally and utterly useless at playing the guitar and knowing nothing about them you cant fool me. Dumble clone was the headmaster at Hogwarts in Potty Harry! 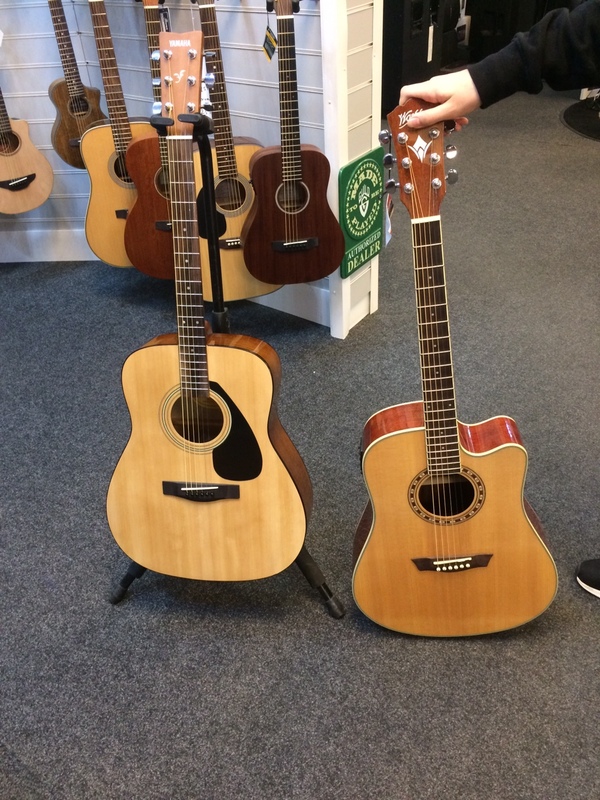 We bought our 13yr old son his first acoustic guitar last week as he decided he wanted to get off the X-Box (which I’m all for). He elected the “Washburn” electro acoustic over the “Yamaha” but we’ve had trouble finding a local tutor to give him lessons. Aps, Dubs, Kevinthedog and 3 others like this. I like the wall mounts.....could do with one for the sons room to get his out of harms way. Surely one guitar is enough? Get him a chord book. Only need to know 3 or 4 to make a song. Plenty of really easy lessons on YouTube. Look up Marty Swartz. He great for beginners and better players, too. It’s all in muscle memory in the fingers. Takes about a month or two to form chord shapes, but once you get your head around it.... Obviously time is a factor for the older new players, but for him, he’ll be strumming around the camp fire by summer!